In honor of the bicentennial of this peculiar episode during the War of 1812, I am re-posting this article I wrote a couple years ago. 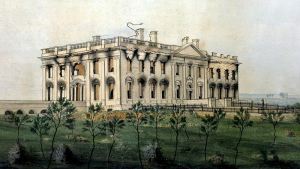 A burnt-out White House, August 1814. The War of 1812 is, in my opinion, a bizarre episode in U.S. History. Both nations went into the war with few clear objectives. Neither were prepared. The campaigns are a litany of tragic, botched efforts resulting in pointless bloodshed. And in the end, everything returning to status quo ante bellum, that is, as they were prior to the war.